At Oakwood Vision Services, Dr. Robert Bisanar OD and our entire Hickory optometry team are committed to providing advanced vision care in a professional and comfortable environment. As an optometrist in Hickory, our primary eye care service includes a complete eye exam that analyzes eye health and vision function. In addition to eye exams and vision testing, Dr. Bisanar OD and our team of optometry professionals provide testing for glaucoma, cataracts and macular degeneration. Our Hickory optometrist also offers glasses, contact lenses, and pre- and post-operative care. Bring intense headaches and blurry vision to an end and have your eyes examined by a qualified optometrist. 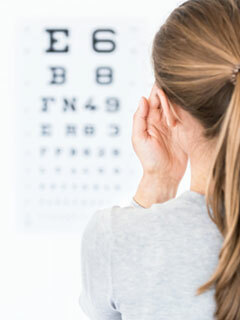 Depend on Oakwood Vision Services in Hickory, NC for quality vision care. Dr. Bisanar and our staff truly care about the health of your eyes and strive to provide effective solutions to your poor eyesight. Call 828-322-8052 or Sign Up. "Love this place. The staff is excellent! Love the selection of stylish glasses they have! I'm satisfied every time I go!"